Police officers in Cheltenham, Gloucestershire have recovered a high value bicycle and returned it to its rightful owner after it was listed for sale on the online auction site Ebay. The Marin Mount Vision 5.8 2009 model bike was stolen, along with a Hard Tail mountain bike, from a home in Hester’s Way Lane in Cheltenham between 10pm on Wednesday August 5 and 5.45am on Thursday August 6. Annoyed by the theft of their bikes one of the owners began searching online auction sites and immediately recognised one of stolen bikes as theirs. The police were alerted and acted straight away carrying out a warrant at an address in Springbank Grove, the marin bike, which is valued at approximately £2850, was recovered and a 29-year-old man arrested. The man was later charged with theft of a pedal cycle and bailed to appear at Cheltenham Magistrates Court on September 18. The second bike has not yet been recovered and officers continue to work to try and locate it so that it can also be returned to its owner. Officers are encouraging cyclists to register their bikes on www.immobilise.com, a website that allows you to create a free, private and secure portfolio of all of your personal property and adds the items to the National Mobile Property Register. If the bike, or registered item, is then lost or stolen the website can be used to tell the Police, your insurer and the second-hand trade to assist in recovering your property and catch the thief. If you are about to purchase a second-hand bike and are unsure of the bikes history we recommend you consider checking the bikes serial number against Immobilise’s sister service CheckMEND – The Second-hand Database of Lost, Stolen and Counterfeit Goods. Anyone who thinks they may have seen the outstanding bike is asked to contact Gloucestershire Constabulary on 0845 090 1234 quoting incident number 94 of August 6. Alternatively you can call Crimestoppers anonymously on 0800 555 111. Avon and Somerset Police has launched a campaign urging people to report mobile phone thefts and add their phones to the immobilise national property register. 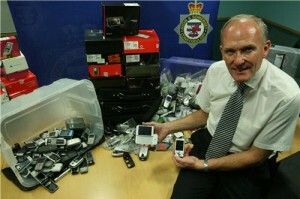 The campaign has been launched following the seizure of nearly 2,000 mobile phones as part of a police investigation in Bristol. However, officers can only establish that 50 of these phones have been stolen as only a small proportion of the phones can be linked to theft-related offences reported to police. Police raided a property, in the St Pauls area of the city, on 21 July and found a range of items, including laptops, cameras and 1,800 mobile phone handsets. We have managed to identify 50 as stolen, 58 have been blocked by the phone’s provider, while another 51 have been registered to a named user and we are currently contacting the owners of these. However, all the others are unaccounted for. It may be that a number of these have been stolen but if they haven’t been registered by the user or the theft hasn’t been reported to the police then it is much more difficult for us to establish this. Of the phones for which we do have details, one handset was stolen from a lady in Weston. It was not insured and she was tied in to a three year contract paying £30 per month. She would have had to carry on paying this for another two and a half years. The Weston mobile phone was worth around £300 and another handset worth £350, stolen in Stevenage just weeks after it was purchased, was also found in the haul. Police are urging people not only to report any phone thefts but also to supply the IMEI (International Mobile Equipment Identity) number when reporting it to make it easier to identify. They are also encouraging people to register their phones on the Immobilise website, which is used by all police forces to check the property they recover. Mobile phone theft accounts for around six per cent of total crime in the area. Most thefts are from walk-in home thefts, pick pocketing or walk-in thefts to shops or other public locations. A mobile phone’s IMEI number can be found behind the battery of the phone or provided by the network provider or by keying *#06# on the phones keypad. Following a number of burglaries in Suffolk, police are urging residents to keep their properties secure at all times. All of the homes that were targeted by the thieves in the Stowmarket and Stowupland area had left a window or a door open or unlocked resulting in items including mobile phones, digital cameras, mp3 players, laptops, wallets and games consoles have been stolen, worth a combined total of over £4,000. It may be tempting to leave windows and doors open whether overnight or during the day in the summer – but this is an invitation to enter your property for a burglar, who will take advantage of the easy access. Whether you are inside or outside in the garden, keep doors and windows secure so only you can get in and out. Most of the items taken are small and easily portable – however they are traceable if you take the right steps to safeguard your property. Security mark items and take photos of any valuables, these pictures could help trace them in the event that they are stolen. You can also register with the free national property database Immobilise at www.immobilise.com. This national system is used by most police forces, including Suffolk – all you need to do is enter the serial number of your phone, computer, MP3 player, bike or anything else with such a code, and update the system if it is lost or stolen. If the police seize stolen property, or an item is found, officers can search the database to find out who the item belongs to, and your property will be returned. You can also use the system to find out if a second-hand item you want to buy is stolen.